West Nile & Dengue Screening | Health Research, Inc.
Our cell-based panels of assays were developed to screen for inhibitors of flaviviruses. Specifically, our assays could be used to examine if inhibitors of West Nile virus (WNV) also inhibit other flaviviruses such as Dengue (DENV), Yellow fever (YFV), Hepatitis C (HCV), Saint Louis encephalitis (SLEV), Japanese encephalitis (JEV), Murray Valley encephalitis (MVEV) and Tick-borne encephalitis viruses (TBEV). Currently, there is only one type of cell-based assay available for screening flaviviral inhibitors and it is limited in overall efficiency since only a single enzyme or protein can be tested and monitored for any potential assays. Additionally, the assay is highly labor-intensive and impossible to use when screening compound libraries in large quantities. Our screening assays are high throughput and sensitive which makes for rapid screening and identification of potential inhibitors in libraries with a large amount of compounds possible. We use “reverse genetic systems”, which are cDNA clones of RNA viruses, and developed them for use in our genetic cell-based screening assays. Comparisons were performed on three cell based high throughput screening assays for WNV drug discovery: 1) an assay with a replicon-containing cell line that allows screening for inhibitors of viral replication; 2) a replicon bearing VLP infection assay that allows screening for inhibitors of viral entry as well as replication; and 3) a full-length reporting virus infection assay that allows screening for inhibitors of any step(s) of the viral life cycle, including entry, replication, and virion assembly. All three assays were converted into a 384-well format, validated with known WNV inhibitors, and now offer speed and sensitivity which make them ideal for screening libraries with large numbers of compounds. Rapid primary screening of large compound libraries for potential inhibitors of WNV and other flaviviruses. Secondary screening to characterize functional activity as well as activity against the target species being tested. Engineering targeted mutations into WNV, resulting in attenuated viral strains that could potentially be used for vaccine development. As a primary screening assay, to analyze multiple viral protein targets simultaneously through large compound libraries. cDNA clones from human pathogenic RNA of West Nile viruses, therefore compounds identified from such an assay may have direct relevance to human disease. The assay system is established. Our panel of assays have been developed for analysis of potential mode of action of potential inhibitors. Pei-Yong Shi is a I.H. Kempner Professor of Human Genetics, University of Texas Medical Branch, Galveston, Texas. He is also adjunct professor of Emerging Infectious Diseases at the Duke-NUS Graduate Medical School in Singapore and Honorary Professor at the Wuhan Institute of Virology, Chinese Academy of Sciences. He received his Ph.D. in virology in 1996 from Georgia State University, USA. After postdoctoral training at Yale University, he joined Bristol-Myers Squibb as a Principal Scientist to develop HIV and HCV therapeutics from 1998 to 2000. He then moved to the Wadsworth Center, New York State Department of Health, to study West Nile virus. From 2008 to 2015, he served as Dengue Unit Head and Executive Director to lead drug discovery at Novartis Institute for Tropical Diseases. 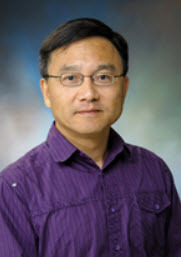 His group developed the first infectious clones of the epidemic strain of West Nile virus and Zika virus, discovered two RNA cap methylation activities of flavivirus NS5 protein, identified essential RNA elements for flavivirus replication, established various platforms for flavivirus vaccine and drug discovery, and pioneered therapeutics development for dengue virus. He has published over 210 peer-reviewed articles and served as Editor (ACS Infectious Diseases, Journal of General Virology, and Nature Vaccine) and Editorial Board member (Journal of Virology, Virology, and Antiviral Research). He is internationally recognized for his scholar and administrative accomplishments at leading research institution, public health sector, and pharmaceutical industry.